Peru is a popular destination for students in Spanish-American, environmental, language and anthropological studies. The South American country was the seat of several prominent Andean civilizations, followed by Spanish occupation. Its diverse topography is dominated by the rugged Andes mountains, the low jungles of the Amazon Basin and western coastal plains, all rich in ecological biodiversity. U.S. colleges have a long history of exchange programs that make semester and summer programs convenient. Students often have the unique opportunity to stay with Peruvian families in their own homes, where they have the chance to experience colloquial language and local customs. For disadvantaged students who otherwise would not be able to afford to study abroad, Benjamin A. Gilman International Scholarships are a great way to study in Peru. More than 2,300 scholarships of up to $5,000 annually are given for study programs around the globe. The Gilman Scholarship Program supports students who have been traditionally under-represented in study abroad. Applicants for the program must be federal Pell Grant recipients. Other criteria for acceptance includes being in good academic standing and a commitment to studying in Peru for at least four weeks. If you want to study in Peru, and want to work for the federal government after graduation, check out the David L. Boren Scholarships from the National Security Education Program. Undergraduate and graduate students who are studying an advanced language and culture studies or a discipline such as business, law, the sciences or agriculture, can apply for this program. Scholarships are awarded to undergrads for up to a year of study abroad. Graduate students can go abroad for up to two years. These are generous scholarships that pay up to $20,000 for undergraduate and $30,000 for graduate students. However, recipients must be willing to pay back their scholarships by working with the federal government. The National Collegiate Hispanic Honor Society, Sigma Delta Pi, is a strong advocate for accomplished Spanish language students. The society features a changing array of scholarships, and many are aimed at providing monetary assistance for undergraduates and graduates who want to advance their studies or conduct research abroad in a Latin American country. 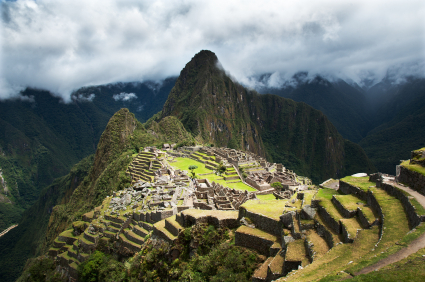 One of the regularly featured destinations is Peru. Not only may students continue advanced language studies, but Peru also is renowned for its Incan ruins, such as Cuzco and Machu Picchu. Archaeology and environmental studies are also popular goals of abroad studies in Peru. The Compton Fund is designed to help offset the cost for students interested in an abroad program that is focused on peace initiatives, environmental sustainability or community service. Preference is shown to minority applicants. The University of South Florida’s Institute for the Study of Latin America and the Caribbean sponsors regular programs of study abroad in Latin American countries, including destinations in Peru. The ISLAC Summer Study Abroad programs are available through scholarships to qualified students. Selection is based on a combination of academic merit and financial need. Graduate students may apply for Student Research Awards, which provide much needed funds to study abroad and conduct research necessary for their degrees. Remember that many study abroad programs change country destinations. Peru is a common destination for colleges with archaeology and Latin American studies programs. Also, scholarships are typically available to international studies students, but most applicants are handled on a first-come-first-served basis and selection is typically based on academics in combination with financial need. So keep checking with the college of your choice.